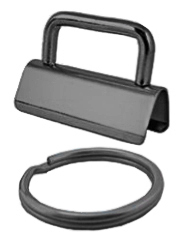 Our Wrist Key Holders make it easy & quick to locate keys inside your bag, and can be worn around wrist so keys are readily accessible while keeping your hands free. The 1.25" width nylon webbing (cut at 14" in length before folding), forms a loop wide enough to slide easily over your hand, and rest comfortably around your wrist. 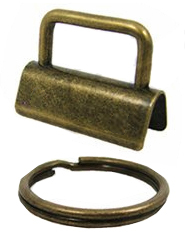 Customizing options include your choice of trim and key ring hardware-finish! Perfect for gifts, or stocking stuffers, our new Wrist Key Holders have quickly become a staff favorite! Coastal Alaska is home to 90% of the world's sea otters! Among the most frequently sighted marine mammals along the shores of Cordova and Prince William Sound, they are social and playful, spending much of their time floating together in groups called "rafts". Sea otter pups, unable to swim during their first weeks of life, are carried on their mother’s stomach. To avoid drifting when resting, sea otters will anchor themselves to kelp. They can often be seen using a rock on their chest to crack open a meal of shellfish while floating on their backs. With up to 1 million hairs per square inch, sea otters have the thickest fur in the animal kingdom. Unlike other marine mammals, they do not have a layer of blubber, so they must rely on their dense coat and a high metabolism to keep warm…..which is why the sea otter must eat 25-30% of it's body weight in food every day! In the 19th century, sea otters were hunted into near extinction. However, as a result of conservation efforts and protection under the Endangered Species Act, their populations are on the rebound.